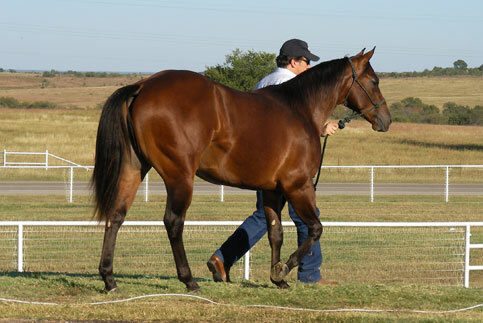 ROOSTERS SPURS (Gallo Del Cielo) Earner of U$S 33,372 and 58 AQHA points: World Reining Trophy Open Reserve Champion; 5th, Mallorca Western Fest Restricted Open and finalist in the Open; 3rd, Reinarama Open; split 6th, Partnership Classic Open; European Champion Junior Reining; AQHA Superior Reining. Roosters Jinglebob (Gallo Del Cielo) U$S 541: Italian RHA Maturity Ltd Open Champion; Challenge Futurity & Show Ltd Open Champion; Italian RHA Derby Ltdd Open Champion. 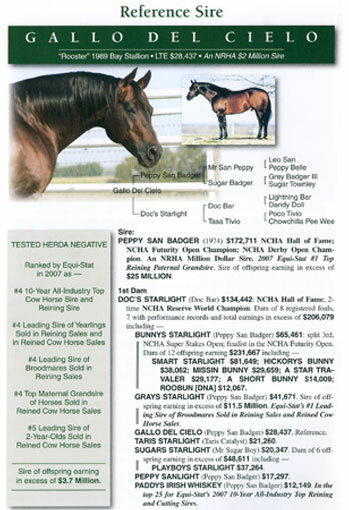 DOC O’LENA (1967) U$S 21,992: AQHA Hall of Fame: NCHA Futurity Open Champion: 2007 Equi-Stat #1 Top Lifetime Maternal Cutting Grandsire; #2 Top Lifetime Paternal Cutting Grandsire; #3 Top Reined Cow Horse Paternal Grandsire; #4 Top Reined Cow Horse Maternal Grandsire. 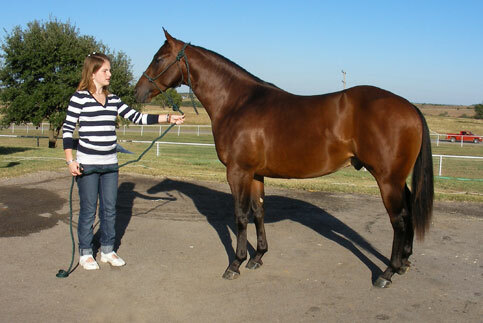 Sire of offspring earning in excess of U$S 15,4 Million. Somthin Somethin U$S 751: NCHA money. EBG Docs Spur (Doc O’Lena) U$S 1,822: See above. SHOTGUN MAGGIE (Doc’s Mahogany) Earner of U$S 12,198 and 2 AQHA points: top 10, Biggest Little Futurity in the World 5/6YO Open; finalist in the PCCHA Derby Open. Shotgun Gussie (Freckles Loverboy) U$S 8,789: 5th, Red Bluff Winter Round-Up 4YO Open; balance of earnings are from NCHA weekend money. 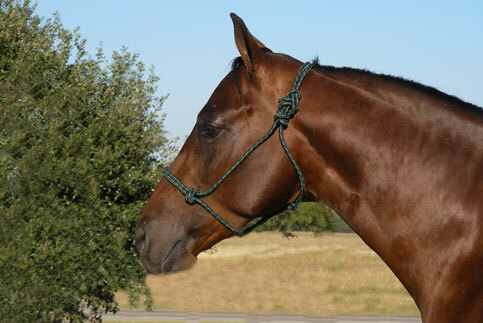 Bueno Spur (Burnt Spur) Earner of 53 AQHA points: AQHA Performance ROM. 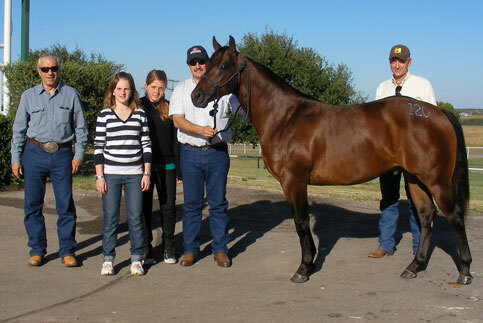 Bea Double Tough (Double Tough Doc) Earner of U$S 1,032 and 13 AQHA points: NCHA weekend money. Miss Tiny Spur (Burnt Spur) See above. STEADY DOC SON U$S 12,590: PCCHA Cutting Stakes Non-Pro Reserve Champion. Fairless Silver Spur U$S 1,052: Spring Classic Youth Bridle Champion.